Author: Joshua A. Lieberman, M.D, Ph.D. Cite this page: Lieberman JA. Klebsiella oxytoca. PathologyOutlines.com website. http://www.pathologyoutlines.com/topic/microbiologyklebsiellaoxytoca.html. Accessed April 23rd, 2019. Indole positive, differentiates from other Klebsiella spp. Contributed by Joshua A. Lieberman, M.D, Ph.D.
16S rDNA sequencing does not differentiate from closely related Raoultella spp. 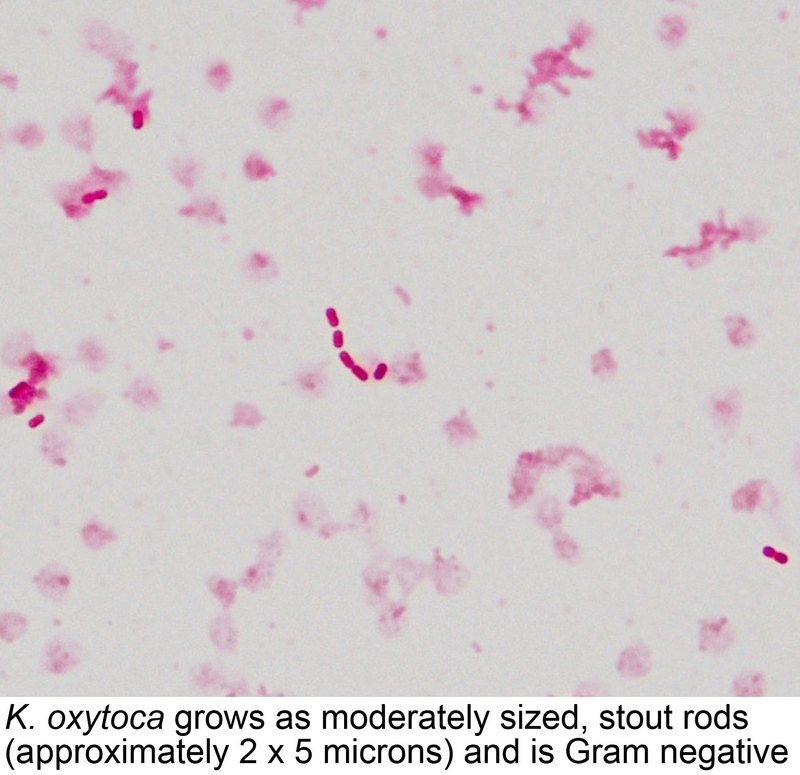 The clinical microbiology laboratory has isolated a gram negative rod from the sputum of a homeless, alcoholic patient with a chronic cough. 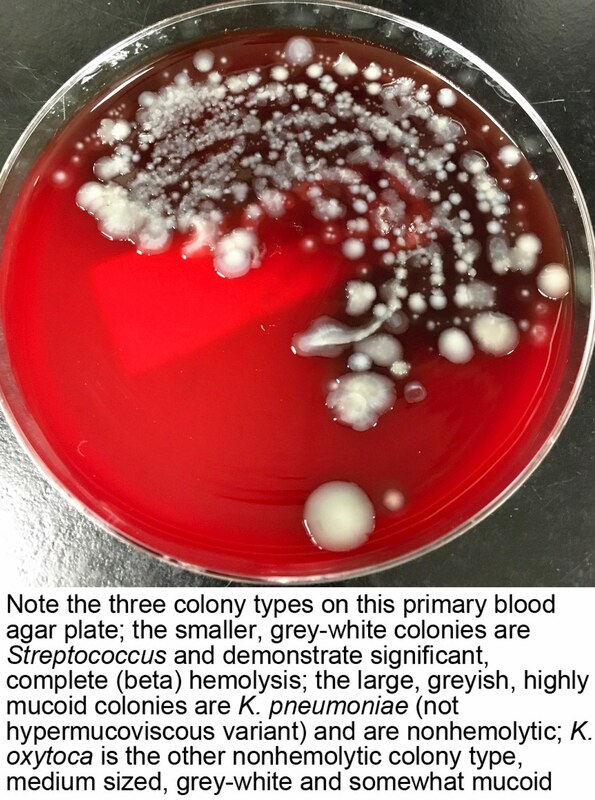 The isolate forms a mucoid colony that turns pink on MacConkey agar and produces a blue spot when placed on filter paper and treated with indole. What is the most likely organism? B. K. oxytoca. Only K. pneumoniae, K. oxytoca and Pseudomonas aeruginosa are gram negative bacilli. Klebsiella spp. ferment lactose (pink on MacConkey's agar), while P. aeruginosa does not ferment lactose. 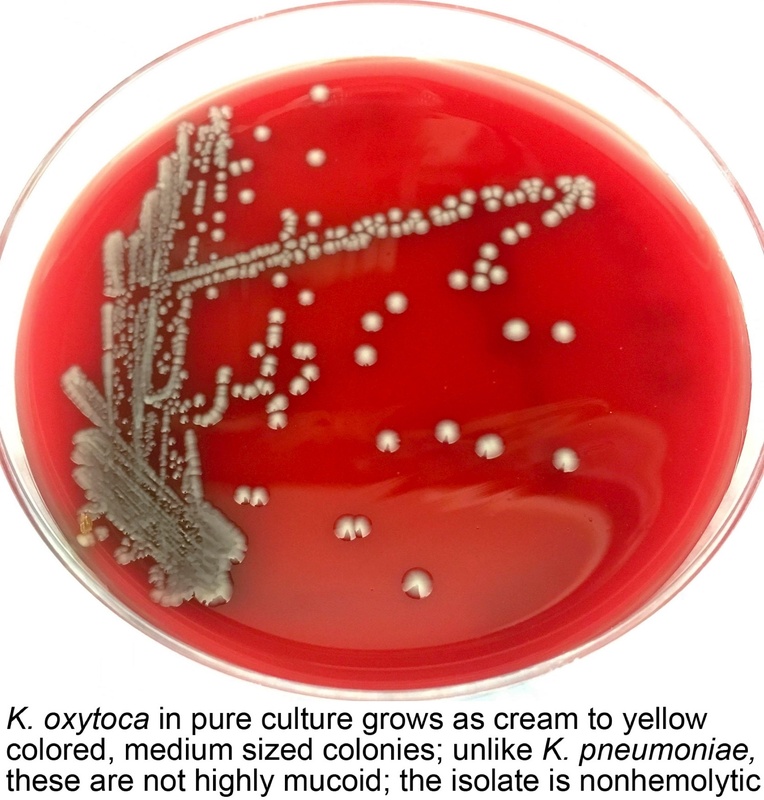 Between K. pneumoniae and K. oxytoca, only K. oxytoca is indole positive. While Chlamydia pneumoniae is gram negative, it is not a bacillus but exists either as a reticulate body (RB) when replicating within host cells (phagolysosomes) or as an infectious elementary body (EB) when passing between cells. C. pneumoniae, like C. trachomatis is therefore not cultured clinically because it requires growth in a eukaryotic cell. For Klebsiella oxytoca, which of the following mechanisms of antibiotic resistance is most important? C. K. oxytoca carries extended spectrum beta lactamases (ESBLs) which can hydrolyze cephalosporins and other beta lactam antibiotics. Specific resistances vary significantly based on the ESBL identified. In addition, some strains will upregulate drug efflux pumps and ESBL production under antibiotic treatment. Mutation of the 23S rRNA is one mechanism of macrolide resistance. The van operon (especially vanA, vanB) confer vancomycin resistance in Enterococci, as well as Lactobacillus and other anaerobes by changing the peptidoglycan structure to D-Ala-D-Lactate. Fluoroquinolone / quinolone anitbiotics inhibit topoisomerase (DNA gyrase) enzymes and mutations in these genes are an important mechanism of resistance to this class of antibiotics.